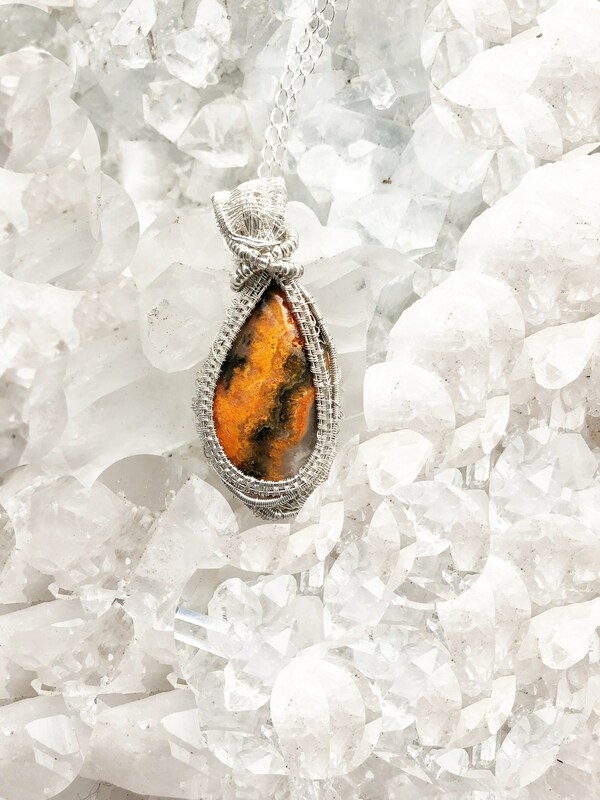 This Bumblebee jasper is so brilliant in color, that it is hard to miss seeing it. 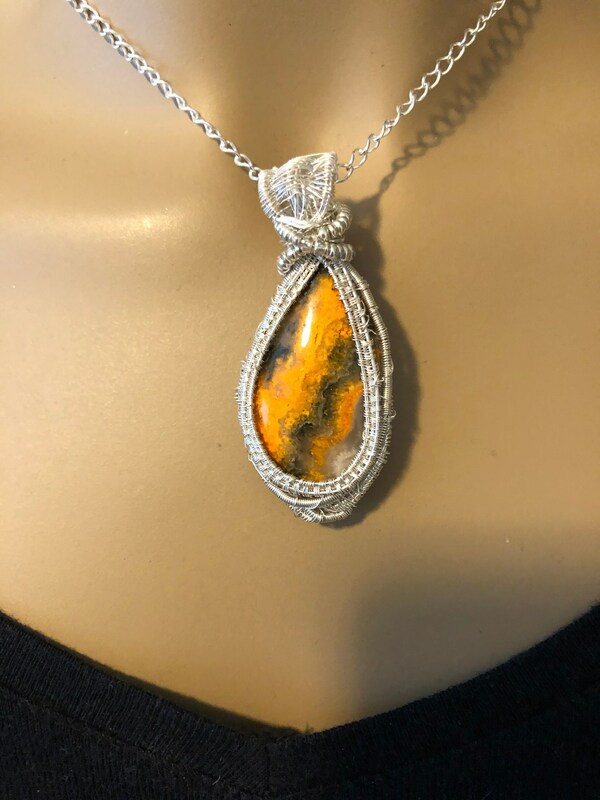 The colors are a rainbow of yellow, orange, and brown set in sparkling sterling on a sterling chain. The chain is 18" and the pendant including the bail, is 2.5 x 1.25". The compliments will come rolling in each time you wear it. Bumble Bee Jasper (or Bumblebee) is actually a combination of volcanic matter, anhydrite, hematite, sulfur, arsenic, etc. There is much debate over whether it is a true jasper or an agate, as some have called it. The lovely patterns on this stone often imitate the coloring found on bumblebees, hence the name. The yellow coloring is due to the presence of sulfur, which is toxic, as is arsenic, so care should be taken - always wash your hands after handling. Bumble Bee Jasper is a Seeker Transformer Crystal. Seeker Transformers are talismans used when the desire is to find a way to transform a part of one's life to a more desirable state. Seekers are used when we need some help to find a new path, a new approach, or in any quest to gain that which we desire but do not yet possess. 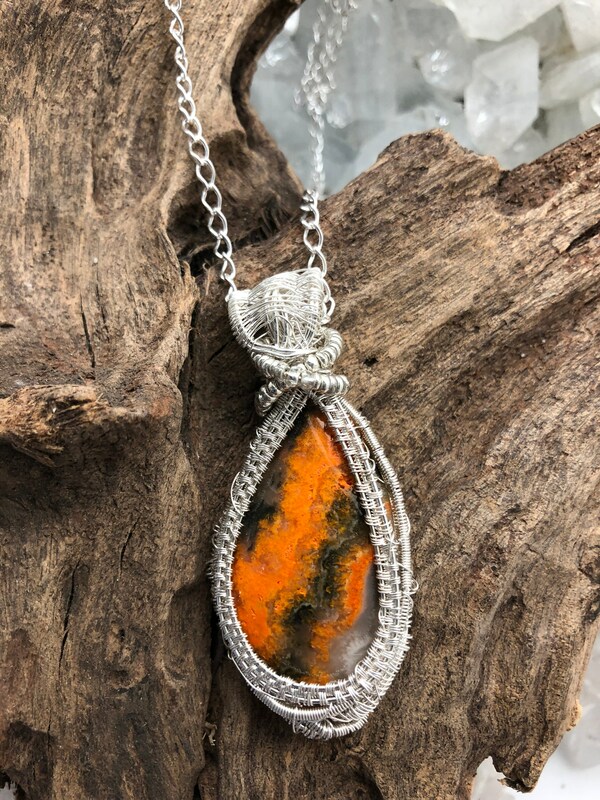 When they possess the Earth Power of the Transformer, like Quartz, they form crystals that are excellent for seeking new capabilities that will transform some part of our life. This crystal is a storage crystal. It will gather the Universal Life Force and can be renewed by sunlight.